Forty-five years ago, on July 16, 1969, astronauts Edwin "Buzz" Aldrin, Neil Armstrong and Michael Collins left Earth in Apollo 11. A few days later on July 20, man took his first steps on the moon. Nearly a half-century later, it remains amazing how the feat was actually accomplished. The astronauts in space and the NASA technicians on the ground overcame seemingly impossible obstacles, and were forced to contend with unforeseen situations such as broken equipment and excess trash. 1. Neil Armstrong's famous quote was incorrectly transmitted. Instead of the saying, "That's one small step for man," the astronaut claims he said, "That's one small step for a man." As he once clarified to a biographer: "I think that reasonable people will realize that I didn't intentionally make an inane statement and that certainly the 'a' was intended, because that's the only way the statement makes any sense." 2. President Richard Nixon was prepared for the worst, as was his speechwriter William Safire. Safire put together a tribute to the Apollo 11 astronauts in case they never made it home. "In ancient days, men looked at stars and saw their heroes in the constellations," the president would have read in one of the speech's poignant lines. "In modern times, we do much the same, but our heroes are epic men of flesh and blood." 3. The flag isn't the only thing the Apollo 11 astronauts left behind. 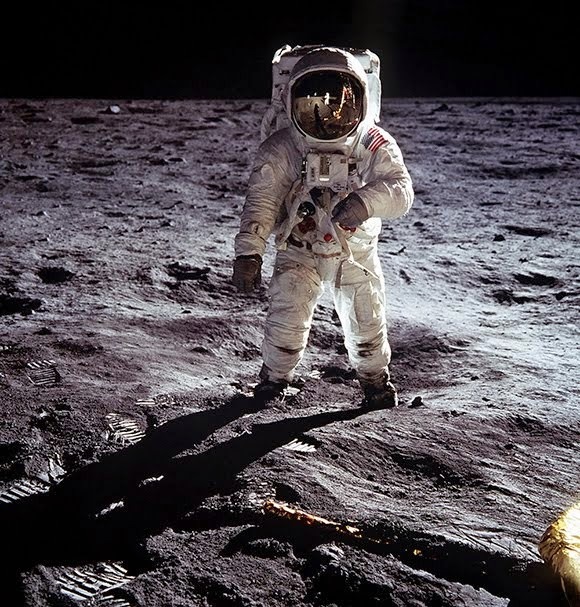 More than 100 items were discarded on the lunar surface, including a commemorative plaque and a gold replica of an olive branch, as well as trash items such as moon boots, a camera, urine containers and air-sickness bags. (Armstrong and Aldrin were told to jettison their junk to make room for the samples they collected.) 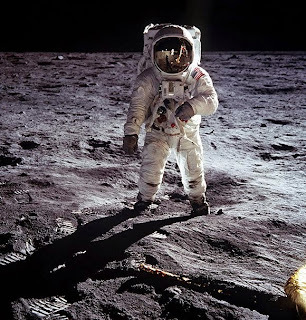 Several states have lobbied to make the lunar landing site a national monument in order to prohibit future moon travelers from stealing these items and selling them on eBay. As one of only 12 people to walk on the surface of the Moon, Buzz Aldrin has amassed an incredible collection of mind-blowing experiences. 5. The Apollo 11 mission insignia was designed by crew member Michael Collins. On astronaut Jim Lovell's advice, he chose an eagle (which he originally traced from a National Geographic book) preparing to land on the surface of the moon with an olive branch in its beak. NASA, however, felt the eagle's talons looked too aggressive, so Collins resubmitted the design with the eagle holding the olive branch in its claws. 6. Upon entering the lunar module to begin their journey home, Buzz Aldrin and Neil Armstrong discovered that a switch on a crucial circuit breaker was broken, leaving them without a way to ignite the engine. They tried to sleep while NASA's mission control worked out a solution, but Aldrin eventually decided to jam his felt-tip pen into the mechanism to use as a make-shift switch, and it worked. 7. According to Collins himself, the astronauts were plagued by "gross flatulence" as a result of excess bubbles in their beverages. "The drinking water is laced with hydrogen bubbles," he wrote in his 1974 autobiography "Carrying the Fire: An Astronaut's Journeys." "These bubbles produced gross flatulence in the lower bowel, resulting in a not-so-subtle and pervasive aroma which reminds me of a mixture of wet dog and marsh gas." 8. The original footage from the lunar camera is gone. First noticed missing in 2006, the tapes were likely erased and reused to record data beaming back from one of several satellites launched in the 1980s. This lost footage, which was much clearer that what viewers saw on television, survives only in the broadcast formats.